The first picture is a set of king size bed pillow shams measuring 20 inches wide and 36 inches long. There is over 2 lbs. of down like stuffing in it. Considering it will be removed from the bed every night it will be a bit unwieldy and also, by the time all the pillows will be arranged, more than 30% of the bed surface will be taken up by pillows. 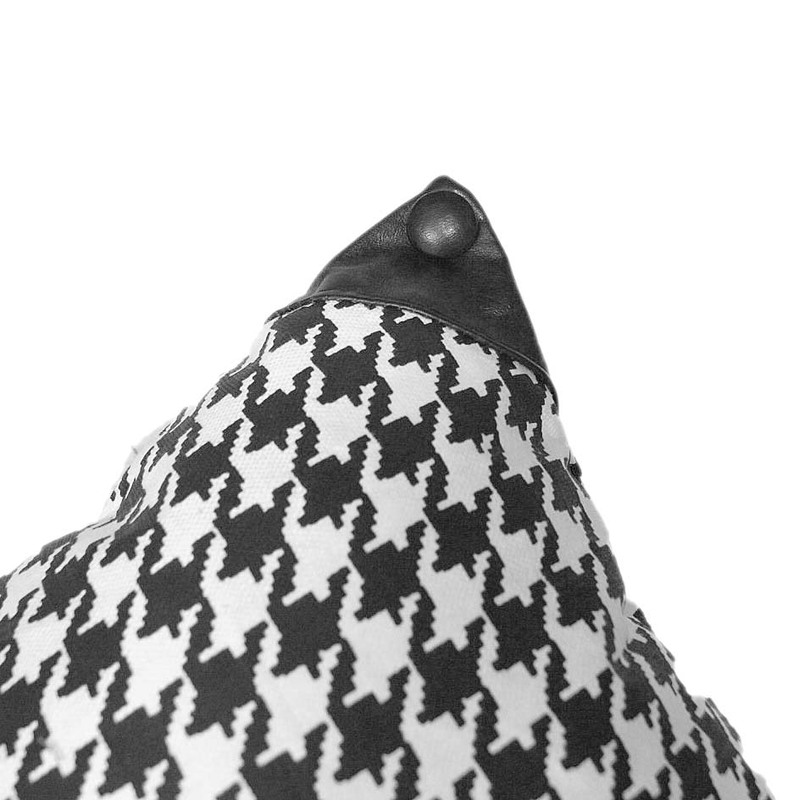 Adding front and back upholstered buttons gives the pillow shams a more interesting, contoured look and condenses their “footprint” by about %50. Behind these pillows will be 3 Euro, full fill, pillow shams, 26 x 26 inches, as the client likes to have pillows to lean up against to watch TV and read. There will be a total of 7 pillows at the head of the bed so space, interesting shape and detail of each pillow or sham will be important. 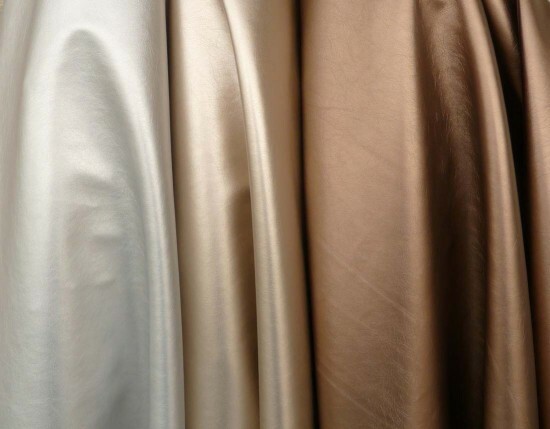 By the way, the three metallic colors on the bedspread will be repeated in these metallic fabrics in the bed skirt, pillows and bed runner (sometimes called a scaldino). 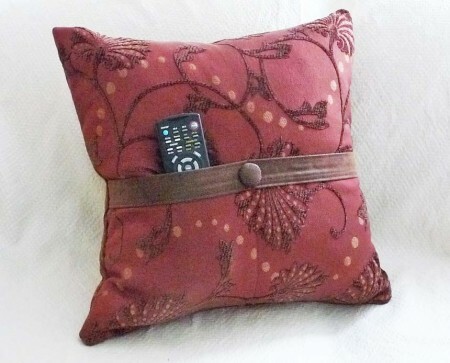 Adding buttons and button holes in a decorative pillow or duvet cover is an alternative to putting in a zipper. 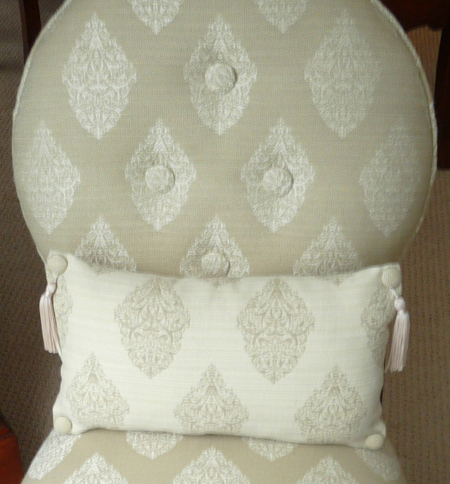 These buttons can be an extravagant embellishment or just basically functional so the pillow cover can be easily washed. I often use a button to anchor a spot on a pillow where there is going to be high stress such as the center of a pocket pillow. While the top of the pocket is double stitched, the button serves to anchor the fabric and therefore not easily ripped by large objects being pushed into the fabric. A center button is also a good place to hang a decorative tassel which gives the pillow some extra “ta-da” elegance. You saw it here first! In my signature lines, Pocket Pillows and the Luxe and Found Collections, I sometimes give my decorative pillows a little edgy look with “ear studs” and leather corners. I haven’t figured out to hang earrings from them yet but that will come. Studded ears are just something different, but you can also single, or double stud the ears to add a tassel as in this little chair cushion.